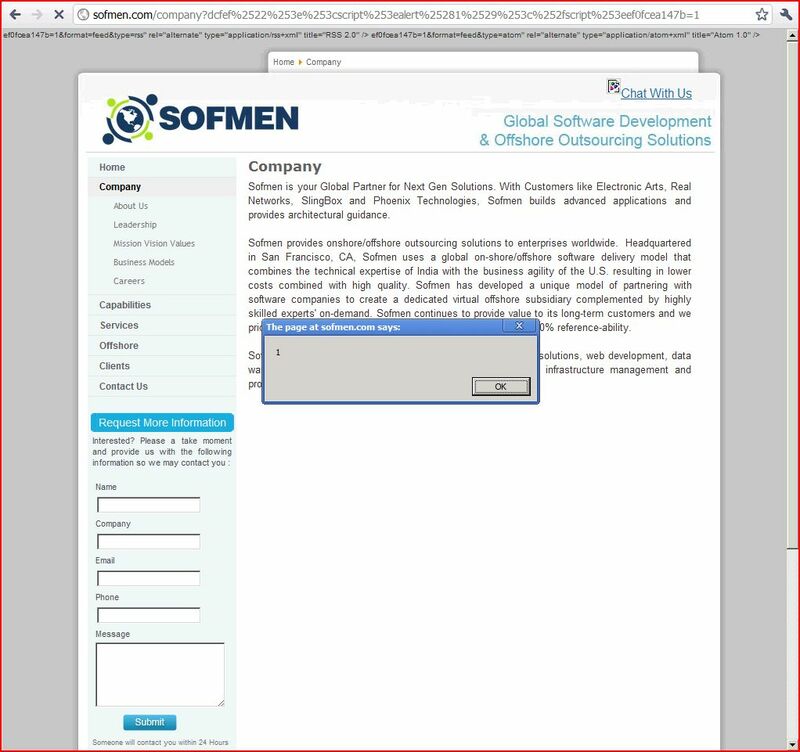 Report generated by XSS.CX at Wed Apr 20 15:25:26 CDT 2011. The name of an arbitrarily supplied request parameter is copied into the value of an HTML tag attribute which is encapsulated in double quotation marks. The payload dcfef%2522%253e%253cscript%253ealert%25281%2529%253c%252fscript%253eef0fcea147b was submitted in the name of an arbitrarily supplied request parameter. This input was echoed as dcfef"><script>alert(1)</script>ef0fcea147b in the application's response. Attempts to prevent cross-site request forgery attacks by verifying that requests to perform privileged actions originated from within the application itself and not from some external location. Such defences are not robust - methods have existed through which an attacker can forge or mask the Referer header contained within a target user's requests, by leveraging client-side technologies such as Flash and other techniques. The Referer header is not a robust foundation on which to build any security measures, such as access controls or defences against cross-site request forgery. Any such measures should be replaced with more secure alternatives that are not vulnerable to Referer spoofing. If the contents of responses is updated based on Referer data, then the same defences against malicious input should be employed here as for any other kinds of user-supplied data. You should review the file upload functionality to understand its purpose, and establish whether uploaded content is ever returned to other application users, either through their normal usage of the application or by being fed a specific link by an attacker. Whether uploaded content can subsequently be downloaded via a URL within the application. What Content-type and Content-disposition headers the application returns when the file's content is downloaded. Whether the application performs any filtering on the file extension or MIME type of the uploaded file. Whether it is possible to construct a hybrid file containing both executable and non-executable content, to bypass any content filters - for example, a file containing both a GIF image and a Java archive (known as a GIFAR file). What location is used to store uploaded content, and whether it is possible to supply a crafted filename to escape from this location. Whether archive formats such as ZIP are unpacked by the application. How the application handles attempts to upload very large files, or decompression bomb files. Use a server-generated filename if storing uploaded files on disk. Inspect the content of uploaded files, and enforce a whitelist of accepted, non-executable content types. Additionally, enforce a blacklist of common executable formats, to hinder hybrid file attacks. Enforce a whitelist of accepted, non-executable file extensions. If uploaded files are downloaded by users, supply an accurate non-generic Content-type header, and also a Content-disposition header which specifies that browsers should handle the file as an attachment. Enforce a size limit on uploaded files (for defence-in-depth, this can be implemented both within application code and in the web server's configuration. Reject attempts to upload archive formats such as ZIP. Note that Burp has not identified any specific security vulnerabilities with this functionality, and you should manually review it to determine whether any problems exist. style='display: none'> <input type="hidden" id="hc8a5_639"